New artist, Josh Mirenda, on the scene. 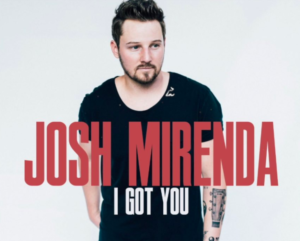 Josh Mirenda I believe is a new artist for us here at Country Music Life. And it’s an artist I’m excited about. He’s on the pop side of things. Country has been moving there recently even though there are some exciting new traditional artists. Anyway, this one got on my radar after seeing it on Hot Country on Spotify. And that’s the big country playlist on that platform so there must be some kind of push going on behind the scenes with this new artist. The song is a good one. I can see why it’s getting attention already. Definitely something that makes you groove a little bit. Got a little uptempo to it that just makes you want to move and sing along with. Pretty straight ahead love song lyrics. The hook is that this guy is ready to commit to this girl. Whatever she needs and wants. He’s ready to listen and to be all those things for her. He’s got her. Whatever she needs. What she wants. It’s just kind of a cool song. That cool vibe that we’ve been getting from new artists on this side of things. Artists like Chris Lane and Chase Bryant. And even a few others. Parmalee is another one. Kind of a new cool guys type of sub-genre in the country world. Slick production, but really cool songs. I’m curious to hear your thoughts on this one. Is it one to love?